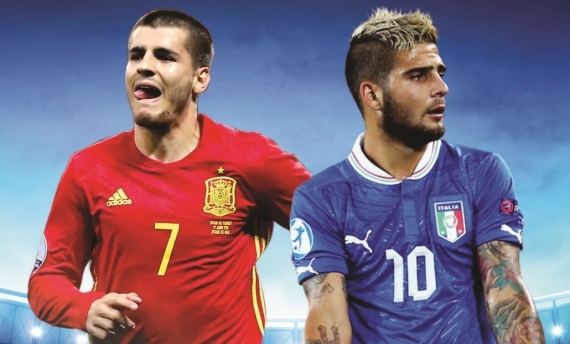 Spain and Italy go head-to-head in what is arguably the biggest tie of the weekend! In what is undoubtedly the biggest match of the weekend with the most ramifications, European giants Spain and Italy will lock horns in what promises to be a scintillating contest. It was even-steven when the sides played to an entertaining 1-1 draw in the first round in Italy, setting up a cracking encounter for the return leg. It’s all or nothing when the powerhouses face off on Saturday evening with Spain and Italy currently level on points in Group G of the 2018 UEFA World Cup qualifiers and this clash will most likely decide who claims top spot. Spain lead Group G on goal-difference with an impressive five wins and one draw from six matches, scoring 21 goals and conceding just three times. Manager Julen Lopetegui has assembled a dream team as usual, but at least 10 stars have been shockingly dropped from the team. La Roja have maintained their unbeaten streak since former FC Porto boss Lopetegui took over the hot seat from Vicente Del Bosque after the 2016 UEFA Euro Championship – a run of 10 matches with seven wins and three draws – at a win percentage of 70 percent. With the villain himself, Diego Costa, excluded from the squad following his trial and tribulation at English Premier League champions Chelsea, Spain’s all-time record goal scorer David Villa, received his first national call-up since the 2014 World Cup. While other eye-opening snubs include Chelsea’s Cesc Fabregas, along with in-form left-back Marcos Alonso and Barcelona's Sergi Roberto. Costa, who has been leading the line for La Roja, is the top scorer in Group G but in Alvaro Morata and David Villa, Spain have the firepower and quality to easily replace the ever-troublesome forward. Manchester City’s David Silva and Sevilla’s Vitolo have also been on form for the national team, finding the back of the net on four occasions each during the group stage. However, Vitolo suffered medial ligament damage during training on Sunday and has been replaced by Real Madrid’s Lucas Vazquez. Spain will always have a team strong enough to beat any team on their day but Italy are not just any team. All eyes will be on Lopetegui’s starting 11 and whether his players can cut through a stubborn Azzurri defence. The Italians, like Spain, are undefeated in the group stage with five wins and one draw from six matches, but scoring slightly less (18) and conceding just one goal more (4). Coach Giampiero Ventura began his reign as the Italian boss at a similar time to the Spanish tactician and also lays claim to a win record of 70 percent after 10 games. Italy are unbeaten in qualifiers – whether Euro Championship or World Cup – since a 3-1 loss to France in September 2006, that’s a run of 56 matches without tasting defeat. The Azzurri have named a squad more than capable of maintaining that outstanding record but know it will be easier said than done against a world clash Spanish outfit. Many Italians have been calling for the inclusion of Toronto FC forward Sebastian Giovinco but yet again the MLS star has been overlooked with his agent calling it “absurd”. With 63 goals in 97 games since his move to the United States and no call-up to the national team since October 2015, eye brows are now being raised and it’s not difficult to see why. However, in Ciro Immobile and Andrea Belotti, Italy have the firepower to put La Rojo to bed. The pair have nine goals between them in the group stages with the former bagging five and the latter finding the back of the net four times. The Azzurri’s water-tight defence, along with their fast-paced counter-attacking gameplay will be key to the Italians coming out on top against La Roja. It’s just a matter of determination, perseverance and hunger for maximum points in Group G’s table-topping decider. Goalkeepers: Gianluigi Buffon (Juventus), Gianluigi Donnarumma (AC Milan), Mattia Perin (Genoa). Defenders: Davide Astori (Fiorentina), Andrea Barzagli (Juventus), Leonardo Bonucci (AC Milan), Giorgio Chiellini (Juventus), Andrea Conti (AC Milan), Danilo D'Ambrosio (Inter Milan), Matteo Darmian (Manchester United), Daniele Rugani (Juventus), Leonardo Spinazzola (Atalanta). Midfielders: Daniele De Rossi (Roma), Riccardo Montolivo (AC Milan), Marco Parolo (Lazio), Lorenzo Pellegrini (Roma), Marco Verratti (Paris Saint-Germain). Forwards: Federico Bernardeschi (Juventus), Antonio Candreva (Inter Milan), Stephan El Shaarawy (Roma), Lorenzo Insigne (Napoli), Andrea Belotti (Torino), Eder (Inter Milan), Manolo Gabbiadini (Southampton), Ciro Immobile (Lazio). There’s no doubt a tight affair is on the cards with very little separating the sides. It’s a game that can go either way and you would be forgiven for getting this one wrong but the Italians look slightly more well-balanced all-round the pitch. With that being said, I’m backing the Azzurri on the Win/Draw Double Chance at 17/20.